A young friend came over and she wanted to make a turtle. We started checking out all the stones I had tucked away awaiting a project. I was thinking of putting it in this plastic tray and making like a turtle pond for it…. 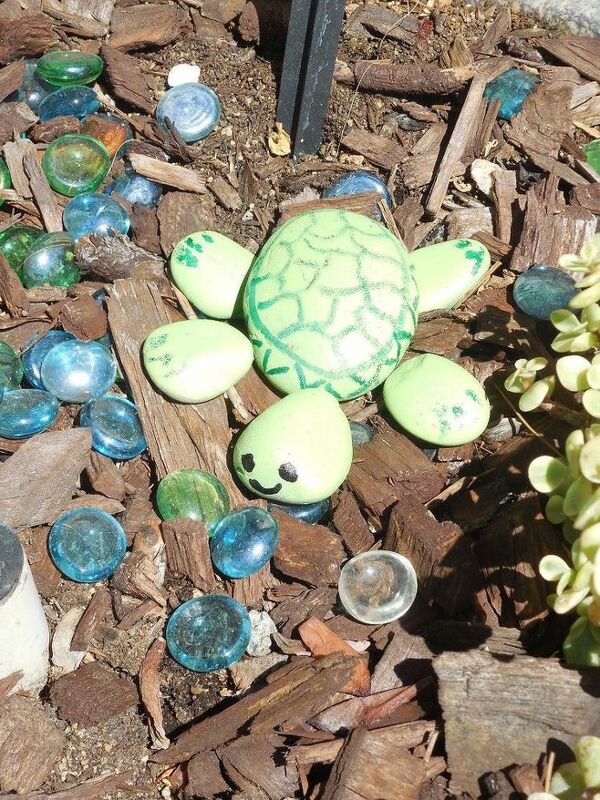 So…we painted the turtle with acrylic paint. Then she put the eyes on with a black marker. She did the head and feet, I did the body with darker green sharpie. So easy and fun for the little ones. Very cute. I’ll have to do this with my grandsons. We have the rocks already from making love rocks which they call “heart rocks” so we can easily do this. I would actually leave the rocks unpainted because they’re so pretty and look like the texture is so wonderful. I’m sure the boys will want to paint theirs, though. Ahh, heart rocks…how cute! Have fun with your grandsons Corina! How many do you have? 3 but only 2 are near enough to see on a regular basis, and my princess, the only granddaughter. I collect turtles so this is one of my favorite posts so far of yours and you do a lot of cool posts. I have a link back to one of your post on my latest post about food. Thanks for sharing all these cool ideas. I am back from a long road trip and I am just now catching up on everyone’s posts. ahhh, how do you feel about frogs?